I was happy that Padre Gabrielli Quartilio, who spent much time with Don Stefano Gobbi, had the COURAGE to offer the following meditation. This is the FIRST of two meditations offered by Padre Gabrielli Quartilio at the International Spiritual Exercises of 2016. The following is a meditation offered by Padre Gabrielli Quartilio to more than 200 priests and more than 10 bishops in the International Spiritual Exercises of the Marian Movement of Priests, in Collevalenza - Shrine of Merciful Love (Madre Speranza), June 26 to 02 July, 2016. Beloved, I thought a lot before writing these brief reflections for these spiritual exercises and I wondered what Don Stefano would have told us, in these times, to understand the signs of the times in which we live. The current situation in the world and in the Church is such that "never has it been like this in the history of mankind and of the Church." “Day by day your sufferings will increase. The crisis, now under way within my Church, will grow deeper to the point of open rebellion especially on the part of many of my sons who share in the priesthood of my Son Jesus. The darkness, which is indeed already growing denser, will deepen into night throughout the world. Marxist atheism will contaminate everything; like a poisonous fog it will penetrate everywhere and will bring many of my children to death of faith. (“To the Priests, Our Lady's Beloved Sons”; http://our-lady-priests.blogspot.it/). “My Adversary will one day think that he is celebrating a complete victory: over the world, over the Church, over souls. It will be only then that I will intervene - terrible and victorious - that his defeat may be all the greater when he is certain in his conviction that he has conquered once for all. What is in preparation is so extraordinary that its like has never happened since the creation of the world. That is why everything has already been predicted in the Bible. The terrible struggle between me, the Woman Clothed with the Sun, and the Red Dragon, Satan, who has now succeeded in seducing many even with the error of Marxist atheism, has already been foretold to you. 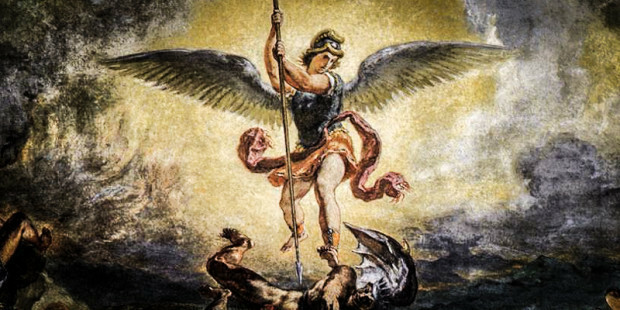 The struggle between the angels together with my children and the followers of the dragon led by the rebellious angels has already been foretold to you. Above all, my complete victory has already been clearly foretold. You, my sons, have been called to live through these events. It is now the time for you to know this, that you may be consciously prepared for the battle. This is now the time for me to begin disclosing part of my plan. First of all, it is necessary that my Enemy have the impression of having conquered everything, of having everything now in his hands. This is why he will be permitted to penetrate even into the interior of my Church, and he will succeed in plunging the sanctuary of God into darkness. He will reap the greatest number of victims from among the ministers of the sanctuary. This will in fact be a time of great falls on the part of my beloved sons, my priests. Satan will seduce some of them by pride, others by love of the flesh, others by doubts, others by unbelief, and still others by discouragement and loneliness. How many will have doubts about my Son and about me and will believe that this is the end of my Church! You all know by now that this message was the last one that Don Stefano wanted to comment on with Franco, John and me, a week before being hospitalized, and then leaving us for Heaven. It's true: he (the evil one) now believes he has everything in hand, even, let me say, perhaps a part of the Movement, because there is the tendency to ignore and to water down the content of the messages that warn us about the errors that lead us the lack of faith and into apostasy. And so I note with deep sadness that the Movement has already forgotten Don Stefano, his charisma, his courage, his clear talk. I think we all remember when he spoke of Freemasonry in the Church, even if he said that Our Lady admonish him. Today one says and does not say ... but even worse, if one cites some messages of Our Lady, where she says clearly the situation in which the Church is living today, one is quick to deny it, even changing the circular letter. I say this with much sorrow and you cannot hide this! Let us ask ourselves: "Would Don Stefano remain silent? Would he make known these messages that speak to us about the Church's situation today at the mercy to the forces of evil?" Oggi si dice e non si dice... ma peggio ancora, se uno cita qualche messaggio della Madonna, dove Lei dice con chiarezza la situazione che vive la Chiesa oggi, ci si affretta a smentire, si cambia persino la lettera circolare. Questo lo dico con molto dolore e non si può nascondere! Chiediamoci: "Don Stefano tacerebbe? Farebbe conoscere questi messaggi che ci parlano della situazione della Chiesa oggi in balia alle forze del male?" In particular, as consecrated priests to the Immaculate Heart of Mary, as members of M.M.P. (Marian Movement of Priests): What would he have said about the second commitment? How to be faithful to the Pope? Which magisterium to promulgate? That of the Church or that which is new, at the expense of the true? I remember that Don Stephen was not afraid to condemn and to say that it was wrong to have the ecumenical gathering in Assisi at the Basilica of San Francesco and he openly declared that it was a desecration. Today there are so many souls harmed, the Truth is shredded every day and in this way one destroys the Church! Do you remember the vision of the Blessed Emmerich that Don Stefano often quoted, who saw bishops, cardinals and priests demolishing St. Peter? "Today it is a sacred duty, for love of souls who are confronted with errors that destroy the faith with real errors, to react and to resist in every way, is more than a duty." I have been reading the blue book since 1976, when Our Lady introduced me to the Movement, and I had never noticed certain messages. When Don Stefano, the week before being hospitalized with a heart attack that brought him to heaven, told us to open up the blue book and he commented on the message that I cited above of 1975, I have reread it several times, not only after his death, but especially now in these times, as well as indeed many other messages, and I noticed things that I never noticed before, which now, for me, are like the `compass' for these times ... for these end times in which we are living in "the greatest subversion of the faith and the apostasy that has spread even to the" SUMMITS of the CHURCH" and thus has darkened and wounded, stricken and betrayed the Church". (Note: The “Blue Book” refers to: “To The Priests Our Lady’s Beloved Sons”; http://our-lady-priests.blogspot.it/). I ask a question to myself and I want to make one also to you. Is it true or is not true that some are scandalized by hearing these messages that with great clarity warn us that these are the times of Fatima? “I have caused to spring up here, for twenty-five years now, my Marian Movement of Priests, so that the message of Fatima, often contested and rejected by many, might in your days come to its complete fulfillment. I was with Don Stefano the evening when Pope Benedict XVI was elected. I remember very well that Don Stefano said that Our Lady had shortened a few years the great trial thanks to Pope Benedict. After the resignation of Pope Benedict XVI, it is useless for us to hide it, there has been produced a split in the Church, and maybe even in the M.M.P., between those in favor and those opposed. Many people wonder how to practice the second commitment, that Our Lady asks us in the messages of Blue Book. Our Lady wants - this always has been and still is - that one obeys the “TRUE MAGISTERIUM” of the Church and not the NEW THINGS. - True is false and false is true. All the confusion arises because we accept as TRUE the NEW. I think that Our Lady is very clear when she explains the term "TRUE." Today there is much confusion, people go after what has the flavor of the doctrinal "NEW" (and this does not please Heaven at all), while the Good is considered false. Our Lady does not dispute about 'for or against' a Pope or a Bishop, She is interested in the TRUTH being offered to all in a very clear way. She makes discernment between what is false doctrine and what is true doctrine. Today, however, one hears often that it is necessary to give rise to A NEW CHURCH, to the detriment of the true Church of Christ, who gives in the name of Christ his Salvation in the Truth, in the Life with the Sacraments, in the Way that is Christ! As Pope Benedict XVI said a few years ago: Today the world powers want to establish THE DICTATORSHIP OF RELATIVISM, to enslave all of humanity. This Wisdom, made flesh in my virginal womb, from Word became man, and has the task of always giving men the gift of eternal Truth. This divine word, contained in Holy Scripture and above all in the Gospel, is the only light which must guide you. But today it is being surrounded by many doubts, because there is a desire to interpret it according to the human way of reasoning and of seeing things, and is often no longer presented in its integrity. Errors are spreading, and, when you come to the plan of God, you are impeded from understanding it in its fullness, because you are making use of an attitude which is too human and which seeks to understand only by means of reason. This is an attitude of pride, and it is the very least to be recommended for approaching the great mystery of God. To understand his truth, it is necessary to be little; to see it in its proper light, it is necessary to be poor; to keep it in its integrity, one must be simple; to give it to others in the splendor of its authenticity, one must be humble. For this reason, with my word, I am forming you to humility, to simplicity and to littleness. I want to lead you to be like so many little children, because only then can I speak to you. My word is a flower of wisdom, which forms you through the Holy Spirit, given to you by the Father and the Son and who leads you to an ever more complete and deep understanding of the Gospel. In the obscurity which today has fallen everywhere, my word of wisdom becomes a ray of purest light which points out to you the way you must follow and the road along which you must go in order to remain always in the truth. Darkness, with a thick, cold fog, has entered the Church, obscuring it in the splendor of its truth. For this reason, every day, my word is forming you to the spirit of wisdom, that you may always see, in the light, the truth which my Son has taught you and proclaim it with courage to all in its integrity. The time has now come when only the little children, cons crated to my Immaculate Heart and entrusted completely i their heavenly Mother, will have the gift of keeping themselves intact in the faith and of bringing to the true faith the souls entrusted to them. My word is also a drop of dew, which I cause to fall upon ti is earth, which has become an immense desert, and upon human in life, so dried up by sin and suffering” (February 9, 1985). This confirmation comes, not only from the blue book, but from many other true devotees, such as: St. Louis Marie Grignon de Montfort in his Treatise on ‘True Devotion to Mary'; La Salette and the three great secrets; Rue du Bac and the Miraculous Medal; Lourdes; Fatima etc., which had a specific task: to preserve the Doctrine of the Holy Catholic Church for the salvation of souls. "When the Church opposes the real powers and the sins of this age, when She denounces the destruction of the family, the killing of children not yet born, the deformations of the faith: then, she is contrasted with a Jesus that it would have been only merciful, who would have been always understanding and would have never hurt anyone. And there is formulated the maxim: you cannot be Christians at the expense of being men; and to be men is then understood as that which seems and pleases everyone. To be Christians is a optional gratification, but it must not cost anything ... Christ ascended the Cross: a Jesus willing to tolerate everything would not have been crucified ... ". “Before Christ's second coming the Church must pass through a final trial that will shake the faith of many believers. The persecution that accompanies her pilgrimage on earth will unveil the “mystery of iniquity” in the form of a religious deception offering men an apparent solution to their problems at the price of apostasy from the truth. the supreme religious deception is that of the Antichrist, a pseudo-messianism by which man glorifies himself in place of God and of his Messiah come in the flesh.” (CCC 675). “The Church will enter the glory of the kingdom only through this final Passover, when she will follow her Lord in his death and Resurrection. The kingdom will be fulfilled, then, not by a historic triumph of the Church through a progressive ascendancy, but only by God's victory over the final unleashing of evil, which will cause his Bride to come down from heaven. 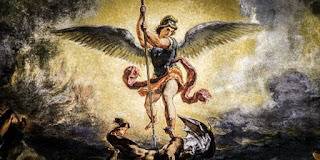 God's triumph over the revolt of evil will take the form of the Last Judgment after the final cosmic upheaval of this passing world.” (CCC 677). Some of the passages of the blue book help us to read and interpret the signs of the times: to make a short but true discernment; so as not to be deceived and to not deceive others; to use them for the triumph of truth; not to get carried away by this impetuous current of "WHAT'S NEW" and Relativism that: takes us away from the true Faith, it plunges us into "a dense darkness of apostasy," and above all, puts in danger the eternal salvation of many souls. “When this Pope will have completed the task which Jesus has entrusted to him and I will come down from heaven to receive his sacrifice, all of you will be cloaked in a dense darkness of apostasy, which will then become general. There will remain faithful only that little remnant which, in these years, by accepting my motherly invitation, has let itself be enfolded in the secure refuge of my Immaculate Heart. And it will be this little faithful remnant, prepared and formed by me, that will have the task of receiving Christ, who will return to you in glory, bringing about in this way the beginning of the new era which awaits you." (May 13, 1991). Our Lady speaks of Pope St. John Paul II, that She obtained for us from the Most Holy Trinity as a great triumph of her Immaculate Heart. In the person and the work of the Holy Father, John Paul 11, I am reflecting my great light which will become stronger, the more the darkness envelops everything… You are entering the conclusive period of the purification and the time might not be measured by you, because it is now ordered according to a design of love that you are called to see soon in all of its splendor” (January 1, 1979). Although nothing official has been revealed, it is said that at the beginning of the Conclave of 18 October 1978, there was opposition to allowing Card. Wojtyla to enter the Conclave, because a freak accident prevented him from arriving in time for the conclave. “Do you see how many of your brother-priests betray this truth, in the attempt to adapt it to the mentality of the world, impelled by a false illusion of being better understood, listened to by more people and more easily followed? No illusion is more dangerous than this. Always announce the Gospel that you live with fidelity and clarity! Your speech must be: ‘Yes, Yes – No, No.’ (cf. Mt 5:37). Everything else comes from the Evil One.” (February 2, 1976). “Satan is maneuvering more and more openly in my Church. He has now associated many of my priest-sons with himself, deluding them with the false mirage that Marxism proposes to all: exclusive interest in the poor, a Christianity engaged solely in the building up of a more equitable human society, a Church which would be more evangelical and therefore disengaged from its hierarchical institutions. This real division within my Church, this real apostasy on the part of so many of my priest-sons, will become accentuated and thus develop into a violent and open rebellion.” (December 31, 1975). “With my motherly voice I am leading you all to understand the signs of the great tribulation. From the Gospels, from the Letters of the Apostles and from the book of the Apocalypse, sure signs have been clearly described for you to make you understand what the period of the great tribulation is. All these signs are in the act of being realized in this time of yours. - Then, in your time, overturnings of the order of nature are multiplying, such as earthquakes, droughts, floods, and disasters which cause the unforeseen death of thousands of persons, followed by epidemics and incurable diseases which are spreading everywhere. - Moreover, your days are marked by continual rumors of wars which are multiplying and are reaping, each day, innumerable victims. Conflicts and dissensions within countries are increasing; revolts and struggles between various peoples are propagating; bloody wars are continuing to extend themselves, notwithstanding all the efforts which are being made to attain peace. Because the Most Holy Trinity has entrusted to the Immaculate Heart of your heavenly Mother the task of preparing the Church and all humanity to live with confidence the hour of the great tribulation, which prepares you for the glorious return of Christ." (December 31, 1987). “The black beast like a leopard indicates Freemasonry; the beast with the two horns like a lamb indicates Freemasonry infiltrated into the interior of the Church, that is to say, ecclesiastical Masonry, which has spread especially among the members of the hierarchy. This Masonic infiltration, in the interior of the Church, was already foretold to you by me at Fatima, when I announced to you that Satan would enter in even to the summit of the Church. - After having destroyed the historical Christ, the beast with the two horns like a lamb seeks to destroy the mystical Christ which is the Church. The Church instituted by Christ is one, and one alone: it is the one, holy, catholic and apostolic Church, founded on Peter. As is Jesus, so too is the Church founded by Him which forms his Mystical Body, truth, life and way. - The Church is truth, because Jesus has entrusted to it alone the task of guarding, in its integrity, all the deposit of faith. He has entrusted it to the hierarchical Church, that is to say, to the Pope and to the bishops united with him. Ecclesiastical Masonry seeks to destroy this reality through FALSE ECUMENISM, which leads to the acceptance of all Christian Churches, asserting that each one of them has some part of the truth. It develops the plan of founding a universal ecumenical Church, formed by the fusion of all the Christian confessions, among which, the Catholic Church. - The Church is life because it gives grace, and it alone possesses the efficacious means of grace, which are the seven Sacraments. Especially it is life because to it alone is given the power to beget the Eucharist, by means of the hierarchical and ministerial priesthood. In the Eucharist, Jesus Christ is truly present with his glorified Body and his Divinity. And so ecclesiastical Masonry, in many and subtle ways, seeks to attack the ecclesial devotion towards the sacrament of the Eucharist. It gives value only to the meal aspect, tends to minimize its sacrificial value, seeks to deny the real and personal presence of Jesus in the consecrated Host. In this way there are gradually suppressed all the external signs which are indicative of faith in the real presence of Jesus in the Eucharist, such as genuflections, hours of public adoration and the holy custom of surrounding the tabernacle with lights and flowers.” (June 13, 1989). “We are before today the greatest fight that humanity has ever seen. I do not believe that the Christian community has totally understood this. We are today before THE FINAL CONFRONTATION BETWEEN THE CHURCH AND THE ANTI-CHURCH, between the Gospel and the anti-Gospel”. “The two great forces – THE MYSTICAL BODY OF CHRIST AND THE MYSTICAL BODY OF THE ANTI-CHRIST – are beginning to draw battle lines for the catastrophic contest. The False prophet will have a religion WITHOUT A CROSS. A religion without a world to come. A religion to destroy religions. There will be a counterfeit Church. Christ’s Church the Catholic Church will be ONE. The false Prophet will create the other. The false church will be worldly, ecumenical, and global. It will be a loose “FEDERATION” of CHURCHES and religions, forming some type of global association. A world parliament of Churches. It will be emptied of all Divine content, it will be the mystical body of the anti-christ. The Mystical Body on earth today will have its Judas Iscariot, and he will be the false prophet. Satan will recruit him from our Bishops. The antichrist will not be so called; otherwise he would have no followers. He will not wear red tights, nor vomit sulphur, nor carry a trident nor wave an arrowed tail as Mephistopheles in Faust. This masquerade has helped the Devil convince men that he does not exist. When no man recognizes, the more power he exercises. God has defined Himself as “I AM WHO AM,” and the Devil as “I AM WHO AM NOT. And it is so: there is only one road in front of us: THAT OF CALVARY, if we want to be truly THE APOSTLES OF THE END TIMES. I wish to close with the message of June 8, 1991, where Our Lady tells us clearly that She has chosen us to be "her property", for Her design to be "apostles" of the end times, to give to humanity and to the Church the testimony of his "design". "Today you are celebrating the liturgical memorial of my Immaculate Heart. This is your feast, my beloved ones and children consecrated to me. You have been chosen by me and called to form part of my victorious cohort. You form part of my estate. I have a great design upon you. This design of mine has been revealed to you in every detail. It must now appear to the Church and to humanity in all its splendor, because these are the times of your maturity and of your public witness. Show yourselves to all as my consecrated ones, as the apostles of these last times. As apostles of the last times, you must announce with courage all the truths of the Catholic faith; proclaim the Gospel with force; and resolutely unmask the dangerous heresies which disguise themselves with truth in order to better deceive minds and thus lead astray from the true faith a great number of my children. As apostles of the last times, you must withstand with the strength of little ones the proud force of the great and the learned, who, seduced by a false science and by vainglory, have torn to pieces the Gospel of Jesus, by propounding an interpretation of it which is rationalistic, humanistic, and entirely erroneous. The times foretold by Saint Paul have come, times when many announce false and strange doctrines, and thus they go running after these fables and stray away from the truth of the Gospel. As apostles of the last times, you must follow Jesus along the road of disdain for the world and for yourselves, of humility, of prayer, of poverty, of silence, of mortification, of charity and of a more profound union with God. You are unknown and despised by the world and by those who surround you; you are often obstructed, marginalized and persecuted, because this suffering is necessary for the fecundity of your very mission. As apostles of the last times, you must now illumine the earth with the light of Christ. Show yourselves to all as my children, because I am always with you. Let the faith be the light which illuminates you in these days of apostasy and of great darkness, and, in these times of such a vast infidelity, let it be zeal alone for the glory of my Son Jesus which consumes you. As apostles of the last times, there befalls you the duty of carrying out the second evangelization, so much asked for by my Pope, John Paul II. Evangelize the Church, which has strayed from the spirit of Christ and has allowed itself to be seduced by the spirit of the world, which has penetrated it deeply and has pervaded it entirely. Evangelize humanity, which has again become pagan after almost two thousand years since the first announcement of the Gospel. Evangelize all men, who have become victims of errors, of evil, and of sin and who let themselves be swept away by the impetuous wind of all the false ideologies. Evangelize the peoples and the nations of the earth, immersed in the darkness of the practical denial of God, as they prostrate themselves in the worship of pleasure, of money, of power, of pride and of impurity. Your times have come, and I have formed you during these years, so that you may be able to give now your strong witness as faithful disciples of Jesus, even to the shedding of your very own blood. When, from every part of the earth, all of you, my little children, will give this witness as apostles of the last times, then my Immaculate Heart will have its greatest triumph." Now the task of the Movement is before our eyes in these words of the Mother; I see no other avenues. The times, for which she has chosen us from various countries and continents, and has prepared us through her wonderful design, made know to us by way of her little son, Don Stefano, have arrived and it is our job to carry out her plan of love and of salvation, without a bunch of ‘BUTS’ and without a bunch of ‘IFS’. Her words are so clear and lucid that there is none else to do but to obey Her, our Mother. But more than ever in these times we must, all of us consecrated, follow Her, our LEADER for this final combat, in prayer, especially the holy Rosary and the Cenacles, so that her Immaculate Heart might triumph as soon as possible. IMMACULATE HEART OF MARY, MY TRUST, HEALTH VICTORY! St Mchael, defend us in ballle. Be our defence against the wickedness and snares of the devil. May God rebuke him we humbly pray and do thou oh heavenly host through the power of God, thrust into hell all the evil spirits who wander the world seeking the ruin of soule. Jesus, only begotten Son of the Father, have mercy on me a sinner! Jesus, I trust in you! Mary, conceived without sin, have mercy on us who have recource to thee! Dear Lord Grant me the Grace to step upon the Devil"s face! and when the day is over and done! let him know that I have won!